The Harvard Library—the largest academic library in the world—includes 20.4 million volumes, 180,000 serial titles, an estimated 400 million manuscript items, 10 million photographs, 124 million archived web pages, and 5.4 terabytes of born-digital archives and manuscripts. Access to this rich collection is provided by nearly 800 library staff members who operate more than 70 separate library units. Descriptions of Harvard's collections for this website are currently under development. For further information, please visit Harvard University Library's website at the link below. Descriptions of Harvard's holding highlights for this website are currently under development. For further information, please visit Harvard University Library's website at the link below. 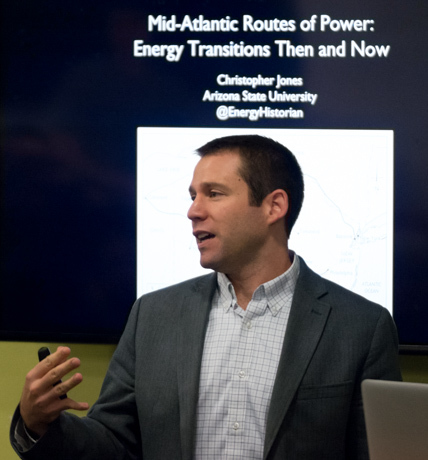 Christopher Jones of Arizona State University speaking at Drexel University. Philadelphia, November 2016.